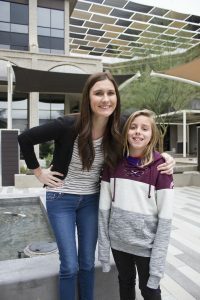 Big Brothers Big Sisters of Central Arizona has named its 2018 Bigs of the Year as part of the National Mentoring Month celebrations. Out of the more than 1,500 volunteers who serve as mentors to youth in Maricopa County, BBBSAZ has selected Ray Hager, Bill Janiga and Kaitlyn Ruddick as outstanding examples of volunteerism and the power of mentoring. Ray, Bill and Kaitlyn will be recognized throughout the year at Big Brothers Big Sisters events, and represent BBBSAZ in the community as they share their personal stories about the power of mentoring. 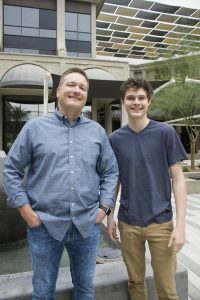 Their stories will be featured at the Pitch In for Kids event on Thursday, February 15th, at 5:30 p.m., at the JW Marriott Camelback Inn Resort & Spa. 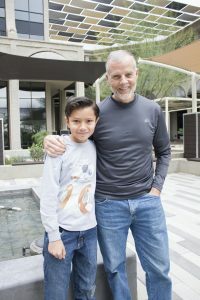 Big Brothers Big Sisters will celebrate the Bigs of the Year along with hundreds of other mentors at the Big Event to be held at 6:00 p.m. on Thursday, March 22, at the Big Brothers Big Sisters office. Evan’s father passed away when he was very young, and his mother enrolled him in the BBBSAZ program when he was 11 years old. She noticed that he was jealous of his peers who had fathers in their lives and knew he needed a positive male role model. He found a role model and much more in Ray who not only has been a positive influence on Evan, but also has taught him important life lessons through activities like volunteering in the community, doing a complete restoration of a vintage VW Beetle, and helping Evan prepare for and land his first job. Evan says that the skills he learned restoring the car have helped him in his job and to be successful at school. They like to take the VW to car shows as a way to demonstrate their friendship. Five years after they first met, Evan is in high school and is planning a career in law enforcement. He says that he owes so much to Ray who he describes as “cool and wise.” Cathy, Evan’s mother, said that she and Evan really “lucked out” when Ray became Evan’s Big Brother. Angel is a bright child who at times needs a bit of encouragement to focus on school, and his teachers felt that he could benefit by having a mentor in the BBBSAZ. Bill, who had been a Big Brother before, meets Angel at his school during their lunchbreak and helps Angel find the motivation to succeed both in and out of the classroom. Bill keeps in contact with Angel’s teachers and holds Angel accountable for his school work. As Angel’s academic performance has improved, they have spent more time together on weekends when they go bike riding and enjoy outdoor activities. Angel’s mother has seen an improvement in her son’s grades, going from Cs and Ds to As and Bs, and in his attitude toward school. They have also felt the ripple effect of Bill’s influence through their family. She said, “Bill is a great Big Brother and he helps him with a lot of things; he also gives me good advice.” Before being matched to Angel, Bill had been a Big Brother to a young man who is now in his 20s and still keeps in touch with him. One of Bill’s proudest moments was when his former Little Brother said he wanted to be a Big Brother so he can help a boy develop confidence, just like Bill helped him. Mady and her three siblings are being raised by their grandmother, who realized that Mady needed a caring adult in her life who could spend one-to-one time with her. When she and Kaitlyn met they became the best of friends almost instantly. Mady says she likes their “adventures” but Kaitlyn knows they are more than simply “fun” because they enable Mady to build confidence. Whether they are snowboarding, watching a sporting event or caring for Kaitlyn’s dog, Kaitlyn makes sure that Mady has positive experiences and an escape from some of the difficulties that her family life presents. Kaitlyn and Mady’s grandmother have formed a strong relationship and Kaitlyn provides guidance and advice to the entire family to help them resources and services for Mady and her siblings. Meanwhile, Mady is a straight-A student and Kaitlyn, who is a teacher, is encouraging her to think about her life beyond high school. Mady’s grandmother says that Kaitlyn has been a wonderful, dependable and caring Big Sister to Mady, and often has gone above and beyond for the entire family.